Kodak Reveals a Digital Super 8 Camera That Records on Film… Wait What?! Screw 360-degree film cameras on drones or Vines on 16-megapixel smartphones. Kodak’s going old school with these little beauties. 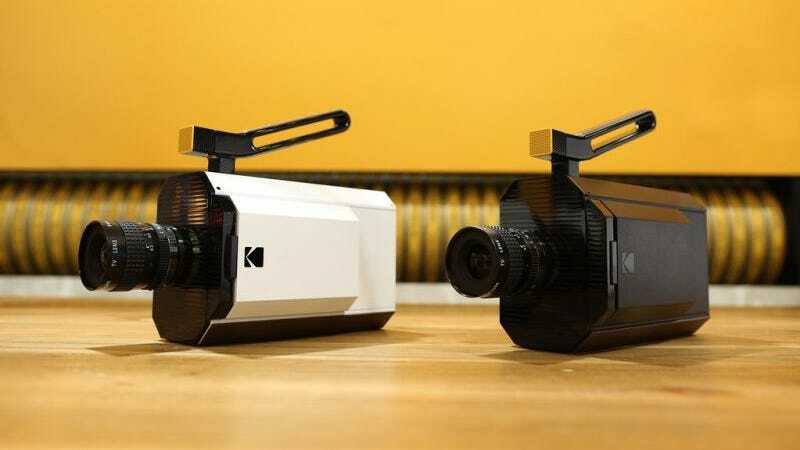 The design is inspired by the Super 8 fad from half a century ago, and these new cameras that shoot film on, well, actual film. Kodak made the announcement today at CES. Industrial designer and Jawbone COO Yves Behar partnered with Kodak to bring the modern relic to life. The cameras feature an integrated microphone, digital viewfinder, and lots of connectivity options like USB cable and SD slots—which definitely didn’t exist in Super 8’s glory days. Balancing the new with the old are the Kodak film cartridges that you’ll shoot on. Kodak chief Jeff Clarke told the Wall Street Journal that the film will cost $50 to $75 a cartridge, and the camera itself will set you back $400 to $750. After processing, you’ll also have two options for media: either digital copies of your home movies or 8-millimeter film you can put in a projector. I would’ve liked them better if they looked exactly like the Super 8 cameras that were discontinued in 1982. But I’m a sucker for anything that harkens back to a time before these inane monstrosities of modernity. No word yet on the precise pricing, but Kodak’s site says the new-old Super 8 cameras will be out this fall.